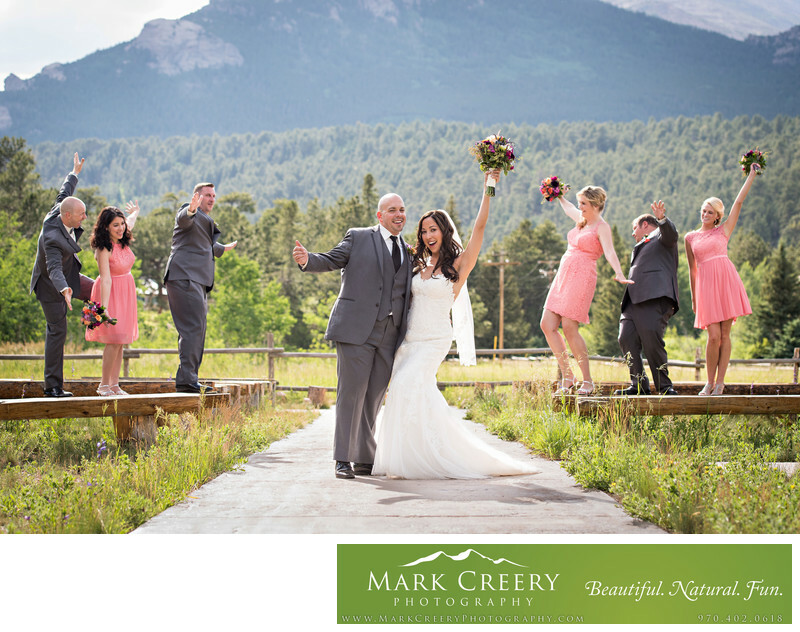 This photograph is of a couple celebrating their wedding at Wild Basin Lodge in Estes Park near Rocky Mountain National Park. As an outdoor wedding photographer I excel at capturing the beautiful Colorado scenery that the couple chose their wedding venue for, as well as showing off the couple's personalities at the same time. In this photo instead of creating a standard boring posed group shot, I used some of the elements available to spice it up. There are some interesting wooden benches at one of Wild Basin's ceremony venues. Half the bridal party went on one side of the bride and groom, half on the other, and then climbed on the benches. The couple spontaneously made 'wahoo, we're married' gestures and the bridal party followed suit with their own silliness, pretending like they were almost falling off. I try not to interfere with fun ideas that the bridal come up with, because it always makes the experience more fun for them. It also leads to more fun ideas and then as a wedding photographer I can feed off that energy and come up with more creative compositions. If you're looking for a wedding photographer for your wedding I live for telling your love story, so get in touch. Wild Basin Lodge and Event Center is a historic luxury get-away that is located in scenic Allenspark, Colorado. Contact person: Christina, (303) 747-2274, sales@wildbasinlodge.com. Location: 1130 County Rd 84, Allenspark, CO 80510.